Albert Bray was born at Malvern on the 14th November 1897, the son of Albert Bray, a clerk at Malvern Council and Mrs V Bray of Willow Cottages, Lower Wyche. He attended the Wyche School from 15th April 1901 until 21st December 1911. In 1901, the Census showed the family living at 3 Ivy Cottages, Lower Wyche. 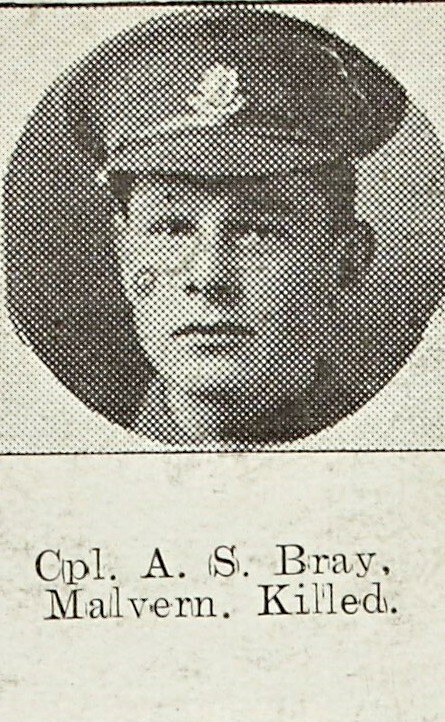 At this time Albert Bray had a younger brother, Stephen H who was born in August 1900. Also living at the cottage was his aunt, Fanny Bray. He enlisted in the 8th Battalion of the Worcestershire Regiment in July 1915 and served with the Second Line battalion. He was killed on the 27th August 1917 at the beginning of the Passchendaele offensive. A memorial service was held for him after Evensong on the 9th September at All Saints Church, The Wyche.